I farm a dairy herd of 200 crossbreeds (previously 300) in SW Wales, with my partner Garry, and we are currently converting the farm to organic standards. In 2008 I took the Homeopathy at Wellie Level basic course in farm homeopathy which inspired me to train as a homeopath. We had always been bent towards organic farming, particularly since discovering homeopathy, but we believed that our land hadn’t enough depth of soil or quality to it to make conversion possible. However, seeing a nearby farm on similar land convert, we felt we had no excuse. 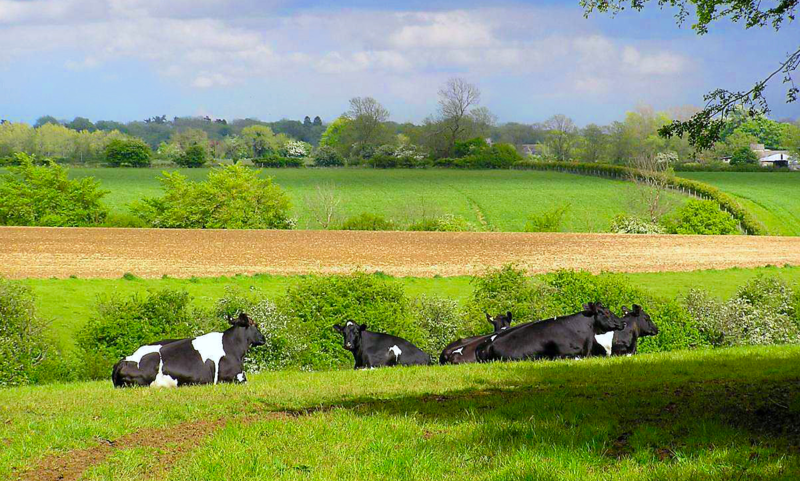 We were already being forced to downsize due to the loss of some land and a member of staff – so why not downsize a little more and convert to Organic? So the decision was made to convert. All non organic commodities were sold; it was an exciting but terrifying decision –all at the same time! We quickly realised that converting was a much bigger step than just not using artificial fertiliser and chemical sprays. My brain went into overdrive when our crop was attacked by cabbage white butterfly caterpillars, and panic bells rang. 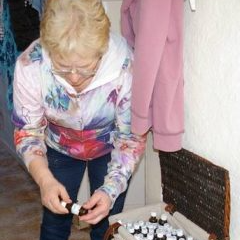 As a student of homeopathy I had witnessed the improvement in the stock’s health over several years of using remedies. Now I considered the radical concept of using homeopathy on plants and crops. Our spraying contractor thought I’d lost the plot, “There’s no smell- no colour –there’s nothing in it!” But I saved my crop by spraying them with homeopathic remedies! This was a ‘light bulb’ moment for me – and then I got to thinking, what else is there we can use? We’d so much to learn. So, we organised on-farm workshops; workshops on Dung beetles and how cattle wormers affected them and the soil; workshops on herbal leys, so our stock could self -medicate, and more. 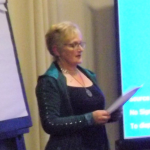 We visited a farmer homeopath in Ireland and she introduced us to Radionics; sending ‘messages’ out to the fields and stock all sounded a little far-fetched –but we believed in and used Homeopathy –so we had to take this on board! I suddenly remembered that I’d been taught at The Welsh School of Homeopathy, that things happen for a reason, at the correct time – was this what was happening? My mind was open, no longer in its bubble concentrating on just milking cows. Radionics then took us a step further; we were introduced to a book by Alanna Moore, author of -‘Stone Age Farming’. Inspired, we booked her for a two day workshop on our farm – and so off we went again -para-magnetic rock dust and Towers of Power are now part of our toolkit. I’ve also engaged a Permaculture student to mentor us and monitor our land and to tutor us in composting and making bio-fertilisers. Dowsers have visited the farm to try and train me in their art; we’re thinking outside the box! We’re spraying good bacteria on to the cow’s teats, pre and post milking in place of chemicals. And no one knows it all! When I first discovered Homeopathy, ten years ago, and realised its potential I felt I had to make more farmers aware of its capabilities. But that was just the beginning, and now, having travelled the path I’ve been led to follow, I’ve found there is a much bigger picture. We have to look at the whole picture to sustain a healthy planet. About the author: I’m Sally, a lifelong conventional dairy farmer who, back in 2004 began to question the amount of artificial chemicals, vaccines, wormers, and drugs I was using on my stock and land.